We are happy to announce the release of a new preview version of OctaneBench with experimental support to leverage ray tracing acceleration hardware using the NVIDIA RTX platform introduced by the new NVIDIA Turing architecture. This application lets Octane users benchmark the maximum possible speed boost Octane will get from RT Core ray tracing hardware in Turing RTX GPUs. This experimental version of OctaneBench is still a work in progress. It will be tuned and updated in future releases as we integrate RT Core support in Octane 2019.2 and later in the coming months. RT core hardware provides significant speed gains for heavy scenes like the one in this new benchmark. 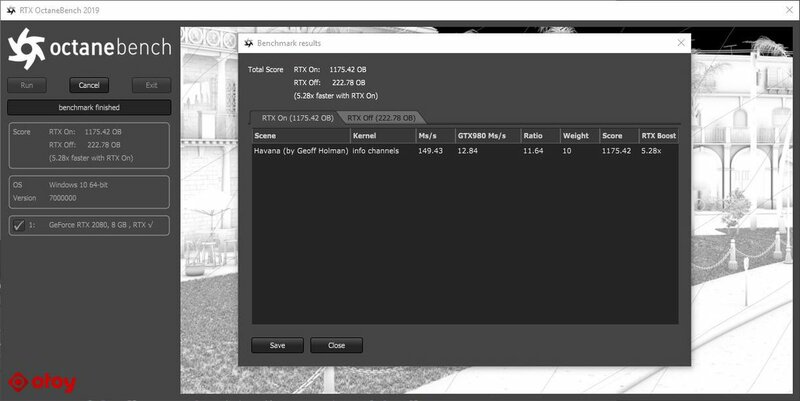 While not created or optimized for RTX, in our testing to date, it has provided the largest speed boost in OB with 'RTX on' for an actual real world scene, so we have selected it as the basis for this benchmark. Besides being geometrically dense, the scene is composed of hundreds of thousands of scattered instanced meshes. The ORBX in this benchmark can be inspected in Octane standalone for anyone interested in pulling it apart. 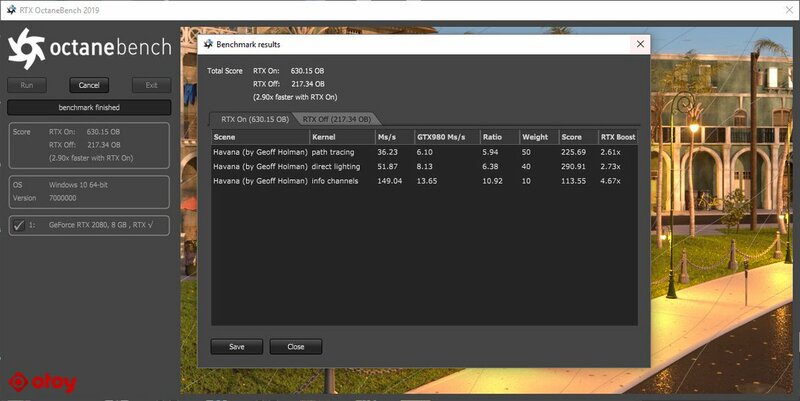 This RTX benchmark will provide two OB scores on RTX cards: one for "RTX on" and one or "RTX off" - and an overall speed boost gained from RT Core being enabled. On non-RTX cards, there will be just one OctaneBench result, which should be in line with previous OB results. 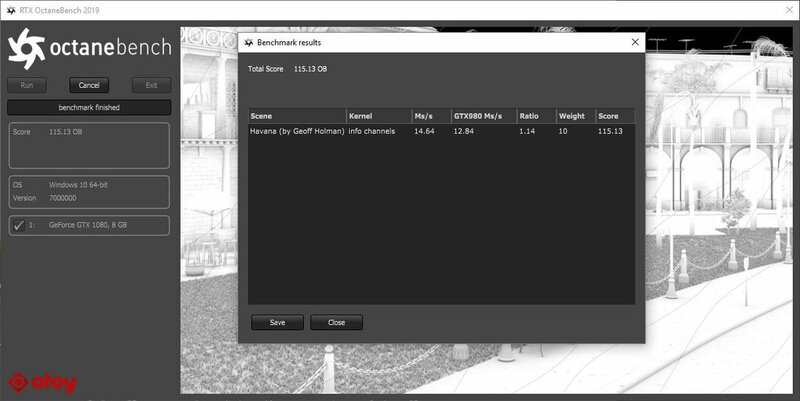 In our testing, on a 2080, we are seeing nearly a 3x speed gain for overall OctaneBench scores with "RTX on". When considering how RT Core hardware will generally speed up rendering in Octane, it is important to remember that RT core speed gains are currently scene specific, and in many other scenes we have tested, we are getting less than half the speed boost we see here (but much optimization work is still to be done). This benchmark should at least provide a minimum (RTX off) and maximum (RTX on) guideline for the speed Octane can achieve on RTX cards. NVIDIA driver 416.94 (GeForce) or 416.78 (Quadro) or newer (except 418 series). Benchmark result uploads have been disabled. A: At this stage only Turing cards support accelerated ray tracing, if you have the right driver you should see `RTX √` next to your GPU's name. Q: I have an NVIDIA RTX series GPU but it does is not displayed as having RTX support. A: Make sure you have one of the drivers stated above or newer. A: It will work but you won't get any speedup measurements as RTX is not supported. Q: Does this leverage NV Link? A: No, the scene in this benchmark will not make use of peer-to-peer memory using NV Link. Future OctaneBench versions will specifically measure NV Link and out of core speeds, as well as denoising speed. Q: When will a version of Octane with full RTX support be released? A: RTX support is currently planned as an experimental feature in Octane 2019 (with a first integration coming in 2019.2). A: That depends heavily on the scene, we've experienced speedups of up to 5x for best case scenarios, this will be lower with scenes with heavier shading or smaller geometry sizes. For this specific benchmark scene which has 1.7M triangles we have seen figures ranging from 2.5x to 3.x. A: Although it is not directly related to the final quality of your render, using hardware acceleration for ray tracing translates into faster render times so you can render more samples and get a cleaner image in the same amount of time as before. I don't have any 20xx series cards but would be very interested if someone can make a google doc and start comparing actual render times of production scenes from C4D or Max or whatever. This "scene specific" is quite vague. How does this affect production environments for film, tv, and other animation works? Sadly still getting old good 418. * driver error. Anyhow. Thanks for sharing! Nowadays, any info about true RTX benefit is good news. And 2.5x speedup for pathtracing increases card value so much! come from high poly scenarios. sbstnc wrote: I don't have any 20xx series cards but would be very interested if someone can make a google doc and start comparing actual render times of production scenes from C4D or Max or whatever. https://devtalk.nvidia.com/default/topi ... an-titanv/. I'm planning to do some testing of my own on high poly scenes, will share results. - Denoising. I don't have any numbers for it but on Optix examples Denoising is very fast. Not sure if it's realtime kind of fast. Will need to check. - In future, people might use Tensor Cores to teach their raytracing engine how to properly shoot 'random' rays in some scenarios. This could introduce better adaptive sampling. For small scenes like few indoor boxes, I noticed 1.6x speedup. Which is still quite good. But it's good to remember that for smaller scenes, you will not hit 2.5x advertised by Otoy. However, if 1 million poly scene brings 2.5x for pathtracing, I'm happy with it! Last edited by michax on Sat Feb 16, 2019 11:27 am, edited 1 time in total. When will PMC kernel back or will new PPM kernel be added? Thanks Michax good to know! Do share when you can. Without any 20XX series all I can do for now is follow results - which will be a determining factor in a lot of people's purchases I imagine, as currently 20XX cards are pretty overpriced unless RTX is going to have significant benefits. sbstnc wrote: Eh, they're overpriced anyway. For games only, RTX is just scam to be honest (for now). DLSS looks horribly blurry. Don't see any benefit to it at the moment in comparison to just lowering your resolution and blurring it. Checkerboarding produces better results then DLSS. I assume it will get better with time, but for Desktop use it's not even close to being usable. All games using raycasting atm introduce relatively small cosmetic increase. Reflections have quite bad quality and are very noisy/unstable in battlefield. Also don't improve that much if you don't pay close attention to it. Global illumination in new Metro indeed improves indoor scenes but again, you need to pay close attention t notice the difference, probably due to map design which wasn't build with realtime GI in mind. There is huge opportunity for new games to shine, when built around realtime raytracing and denoising. But it's not feasible for AAA developers now to build their games around it (limited userbase, and early technology state). However, this is great opportunity for indie developers to shine and trace! Quake with raytracing is nice example of what RTX can bring. I personally cannot wait for strategy games with realtime path tracing incorporated! it seems like perfect scenario due to dynamic nature of a map. Games with heavy destruction can benefit as well. Imagine shooting hole in your roof and whole room is getting properly lit based on incoming light (probably not fully doable in this generation without heavy temporal gathering). Offline rendering is another story RTX cards were built for us! I hope nvidia will not give up and continue with improvements for RT Cores. I also hope AMD will join them. Agreed about this. Given the relative bad reception of RTX cards and slow sales, probably due to high prices, i hope Nvidia wont re-evaluate and release future gaming series without the RT hardware...since Quadros are out of my budget. Anyway, since RTX is gonna come with Octane 2019.2, can we have ETA for that? I kinda hope it arrives before the 3000 series cards hit the market. WOW! This is awesome 2.84 times faster with the 4 Titan RTX's, 1290.63 OB RTX OFF - 3659.67 OB RTX ON, that is insane. That is like having 15.5 1080 TI's and the whole system is only pulling 1140 watts of power and easily staying cool on air. Is there a way to Beta test this with our own scenes?